These days the former palace of the Sultan of Kutai (or Kutai Kertanagara as some call it) is a museum. It has been such since 1971 when it was opened to the public by Suharto’s New Order regime. The sultan had been stripped of any residual powers in 1960, a time when the national government in Indonesia was keen to stamp out traces of separatism or alternative authority; the late 1950s had seen particularly nasty guerrilla movements challenge Jakarta’s authority in Sulawesi, West Java and Sumatra. Early in the new century, with the pendulum swinging back in the other direction and a new era of decentralization dawning, the Sultanate of Kutai was restored, but the former palace had remained open to the public as a museum and it was here that we headed, looking for a glimpse into the royalty of East Borneo. As fans of art-deco architecture, we were delighted to find that the Istana Mulavarman- named after the Kutai king from seventeen centuries before- was a wonderful example of modernist design dating from 1935. We weren’t surprised that there was an art-deco building in Indonesia per se- the major Dutch cities of the time, such as Bandung and Surabaya, boasted plenty of experimental between-War architecture- but art-deco and Borneo were two very incompatible concepts to us, one suggesting urban sophistication and the other untrammeled jungle wilderness. Yet having found the art-deco palace there, we were intrigued and quickly pronounced the Istana Mulavarman a fascinating historical oddity. Mounted on a concrete pedestal at the centre of the unkempt garden was a statue of some kind of mythological beast, coated in gold paint. It was one of those imaginary creatures which was a composite of several different real animals, and it reminded us of the Singa Barong, a similarly composed mythological beast which was the symbol of the royal family in Cirebon, a small sultanate in West Java. There were two more of these beasts set at the stop of the stairs at the entranceway to the palace. Based on the likeness to the Singa Barong, we guessed it must have been some kind of symbol of the Kutai Royal Family, but it wasn’t until we were inside the palace-museum that we learned the details. It turned out that this fabulous beasty was the Lembuswana, which had a lion’s trunk, an elephant’s trunk, the wings of a Garuda– the mythological bird who was the mount of the Hindu God Vishnu- and the scales of a fish all over its body. Apparently this symbol had been linked to the Kutai royal family as far back as the days of Kutai Kertanagara in the late Hindu-Buddhist era and was also known to the Dayak tribes living in the jungle interior. The creature was said to symbolize the semi-divinity of the Sultan and his family, hence evoking the Hindu notion of the God-king which was associated with Hindu courts everywhere from India to Cambodia. We also learned that a giant statue of the Lembuswana had recently been built on one of the islands out in the Mahakam off Tenggarong. Apparently this creature was still a living symbol of the kingdom of Kutai in the modern era. This was not to be the only interesting revelation from inside the building, though the architecture itself was also of interest. Most of the furniture had been lost or removed, so the interior was rather austere from that angle, but the trimmings and the design of the building itself were attractive. The floors were fashioned from cool, white stone- was it marble?- and colored glass had been used in some of the rooms to give a stately, regal air. This was nowhere more evident than in the throne room, where the wooden throne of the Sultan of Kutai, known as the Singasana, was still on display. It was surrounded by a number of yellow ceremonial umbrellas with fringing hanging down. The tableau was completed by a panel behind them showing the Sultan of Kutai; he looked out at visitors with an air of royal disdain. It was amazing to think that a monarchy of some kind had existed in this region since the days of the Mulavarman, in the second half of the fourth century. As peripheral as Tenggarong seemed in the modern world, it was the centre of a truly ancient court- one of the oldest in all of Indonesia or, indeed, South-East Asia. The rest of the museum housed some interesting Dayak artefacts: woodcarvings of hornbills, crocodiles and other totemic figures. There was also a diorama showing traditional costumes from around the archipelago, scale models of different Dayak longhouses from the interior and even a monster stuffed croc which had been hunted upriver on the Mahakam. There were a collection of stone statues from the first millennium BC, illustrating major figures of the Hindu pantheon; these offered the clearest confirmation of all to us that this region really was home to one of the oldest Hindu-Buddhist kingdoms in all of South-East Asia. 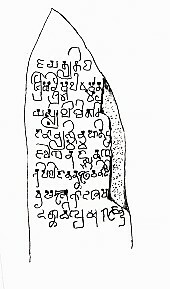 Finally, there was a replica of the yupa from Mulavarman, a 1600 year-old stone boundary marker inscribed with words in the Pallava script: the original was apparently on display in the National Museum in Jakarta. But what interested me most was the hints of long trade ties with other Asian kingdoms, notably China. Like most of the other maritime trading kingdoms of Indonesia, Kutai had accumulated a lot of antique porcelain over the centuries. Most of it was blue and white wares from China dating to the Ming and Qing dynasties, though there were also larger water jars covered in a brown glaze, some of which showed stylized pictures of nagas– the local word for dragons- on the side. Clearly links with the Middle Kingdom had existed since antiquity, dispelling Western notions of Borneo as a ‘untouched jungle wilderness’. In seeing these exhibits I recalled that Chinese jars, plates and bowls had long been prized possessions of the Dayak tribes of the interior, who had a tradition of keeping pustaka, sacred heirlooms, in their longhouses. The Dayak had clearly been trading jungle products for beautiful Chinese porcelain since well before the colonial era. In fact I later learned that the Western name for the island, Borneo, was a corruption of the old Chinese names for the island, Bo-ni or sometimes Po-ni. These sounds were also reflected in the name of the microstate Brunei, which was the third country controlling parts of Borneo, along with Malaysia and Indonesia, and which had once controlled half of the island in its heyday. All of this suggested that however minor a role Borneo had been allocated in the traditional histories of Indonesia and Southeast Asia, it had long been of interest to foreign traders- Chinese and Indian in particular, though even Vietnamese and Thai ceramics were on display- and that it had been tied to international trade networks far more deeply than its romanticized image would have suggested. As for the art-deco architecture, we learned that like many symbols of indigenous political authority, the previous palace had fallen victim to the cannons of the Dutch East Indies. The previous palace had been a timber affair which was much more closely linked with the wooden architecture of the Dayak tribes. Fortunately, we were soon to learn that there was more to the compound than just that palace and that the royal mosque and tombs had survived the Dutch onslaught. It was to these that we turned our attentions before leaving the Museum Mulavarman. Out behind the mosque was a long wooden pavilion, a high roof raised on columns, beneath which the Kutai royal family (and their most trusted advisors and generals) had its graves. Typical of many pre-colonial Indonesian wooden structures, it was an airy, open affair, designed to offer shade and coolness in an era before electric fans and air-conditioning. The graves were mostly small, stone and somber creations as was befitting a graveyard of pious Muslim rulers. Any ostentatiously large grave could be seen to be stealing glory from God; and indeed, some of the more popular graves did seem to attract pilgrims. Further back behind this pavilion was a very handsome nineteenth-century royal mosque, which, like the pavilion, gave some sense of an older royal architecture for Kutai. It had a tiered roof and a wooden porch around the edge, like the older Javanese mosques, and it was a very attractive piece of vernacular architecture, reinforcing the Muslim identity of the Kutai sultans in the past few hundred years. At this point we had seen most of what there was to see from the Sultanate of Kutai, and we walked down to the riverfront to get a better idea of its wonderful location. There were some weathered, old wooden stilt-houses along the banks, and some of these had restaurants inside. It was already lunchtime, and we were lured inside by the promise of grilled giant Mahakam river prawns. These were hardly cheap by Indonesian standards at twenty-five thousand rupiah apiece, but we thought we would never have a chance to try them again. We ordered them with rice, Indonesian salad (a weedy-looking sprinkle of greens) and a couple of es jeruk (iced orange cordials). When they came they were indeed much larger than the traditional prawn and they had much more of a developed outer shell, somewhat resembling a miniature lobster. Cameron found the meat rather gamey and chewy and said he wouldn’t be bothered with them again. I mostly agreed with him but was glad we’d tried them once. Before we left Tenggarong, returning that afternoon to Samarinda and then the following day to the modern boom-town of Balikpapan, thrown up by oil money, we made one more stop in town. This was to a small antiques and souvenir shop which we had seen in another dilapidated wooden structure along the river. We were drawn in by the collection of faded old Chinese bowls and plates which the owner, a white-haired grandmother in a batik sarong, had up for sale. Inspecting them, we realized that they were certainly old Chinese trade porcelain, probably from the late Qing era. These kinds of plates and bowls were ubiquitous in the old port cities of Indonesia and could be often be bought for a song. We thought that these pieces were probably genuine as they had the faded, third-rate look of pieces which have been underwater for a long time. I asked the grandmother where she had got them, and she told us that divers went down along the banks of the Mahakam in Tenggarong, looking for porcelain, coins, and other historical bric-a-brac among the brown river silt. Apparently these sorts of finds were still common and she made a living selling some of the lesser pieces to tourists like us. We asked her how much she wanted for the best of the bowls and she quoted a much lower price than you would hear anywhere in Java, so we ended up buying the best two pieces. We have kept them to the present day, an historical souvenir from our trip to possibly Indonesia’s oldest Hindu-Buddhist kingdom. It is often said that little remains of Thailand’s Dvaravati period, especially in the form of monuments of archaeological sites. Guidebooks to Thailand give very little to no attention to the historical remains of the Dvaravati civilization, giving the false impression that there is nothing to see. However, the more I have researched Dvaravati, the more inaccurate this impression has come to seem. There are quite a number of interesting sites in Central Thailand where you can see traces of Dvaravati. One of these are Mueang Khok Mai Den (also known as Meuang Bon) in the modern province of Nakhon Sawan. In the early period of Thailand’s history, its highways were its rivers, and the rivers of Thailand clearly played a crucial role in the spread of civilization in this part of the world. Tellingly, almost all early settlements were located on or near major rivers. The city of Nakhon Sawan is located at the confluence of two of Northern Thailand’s major rivers: the Ping and the Nan. Downstream from here they are known as the Chao Phraya River, which is the main waterway of Central Thailand. In Dvaravati times, trade and technologies must have passed through this part of the country. Hence, it is not surprising that there were once major Mon-Dvaravati urban settlements hereabouts. The most impressive and important of these is located 32 km from the provincial capital and is known as Khok Mai Den. The archaeological site is 250 metres long and 600 metres wide, meaning it was a medium-sized settlement of the period. Like most other Dvaravati settlements, it had a moat and protective earthen walls, traces of which still survive. Within the walls are some basic brick stupas, all of them square-shaped, most of with small raised platforms where religious rites could be performed. The largest one (featured in the photo above) has staircases projecting outwards from the body of the temple. These stupas now look quite bare and spartan, but they may once have been covered in terracotta art, which would have given them a more beautiful and sensual appearance. While the monuments are not very impressive as pieces of architecture, they do reveal quite a bit about the society which built them. Most obviously the stupas were built by Buddhists, the Mons being the earliest Buddhist civilization in the territory of modern Thailand. It is also worth noting that the stupas are all located within the moat of the city. This indicates that the local ruler wanted to be seen as a patron of the faith, encouraging the construction of Buddhist in the innermost zone of the city. It is very likely that supporting and sponsoring Buddhism would have strengthened the legitimacy of the local ruler. Further insights into the site of Khok Mai Den can be gained at the site museum. It shows the artistic legacy of the settlement was considerable for its size. There are several beautiful bronze Buddhas which display the graceful designs of the period. Many of the Buddhas are performing the vitarkamudra posture, which looks something like the Western okay symbol. These indicate that there must have been workshops of high quality in the area. Even more prolific are the terracotta finds, which include Buddha fugures but also amulets and decorative panels which would have covered the exterior of temples. For many visitors, the museum may prove more illuminating than the modest architectural offerings.